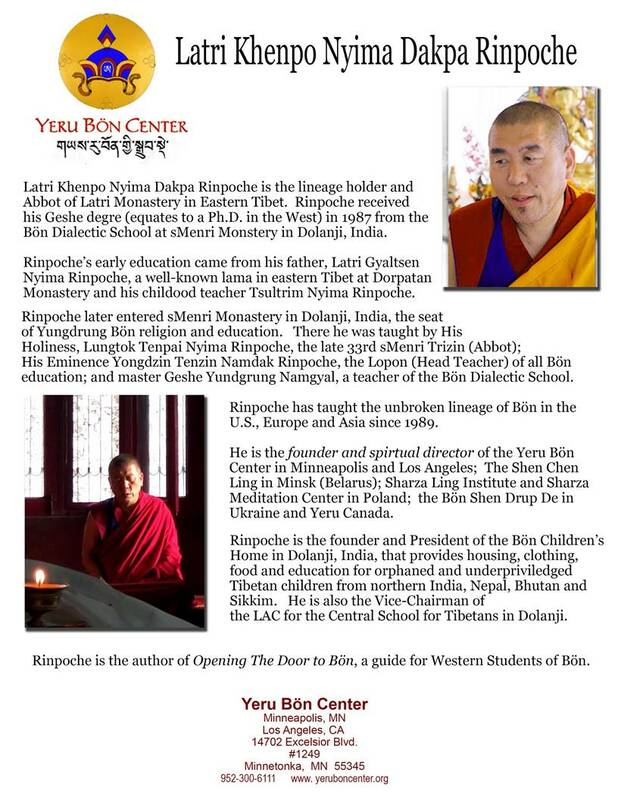 Latri Nyima Dakpa Rinpoche will talk about the 18,000 year old, unbroken, ancient Tibetan tradition of Yungdrung Bön and how through practice, you will awaken your innate Wisdom, Healing, and Peace. Rinpoche will show that we have our own innate powers of inner healing and how we can train our Monkey Mind through Dzogchen Meditation. You will discover and learn the essence of your mind through meditation by closely watching and monitor your thoughts, leading to a deeper level of your true self. Through this ancient Tibetan Yungdrung Bön Meditation practice, you will understand how your experiences of sorrow and anger can cause deep stress, health issues, and depression. Experiencing less negative reactions and happiness can heal, bring joy, and lead to understanding in your life. Rinpoche will lead and guide you through meditation practices and will be open for open conversations and questions to clarify any confusions in this practice as well. To register, visit the Omega Institute.